Get a completely free copy of my Promo Buddy Internet marketing database software! Yes, it’s yours for the taking – Not just a demo version…. but the full version of Promo Buddy 2.0 which I have been successfully selling over the last 3.5 years with a selling price between $67 and $97…!!! “When I got the program, I soon realized that this program has a lot of very useful functions for any active Internet marketer. This is simply a fantastic tool for getting extremely organized in your e-business. In short, PromoBuddy is an excellent tool for organizing your whole e-business and all your tools. Seldom have I been so positively surprised by a software product. In my opinion, Frank has produced one of the most useful software programs for any active Internet marketer, that I’ve yet seen. It’s a fantastic product, and I strongly recommend that you invest in it as soon as possible. 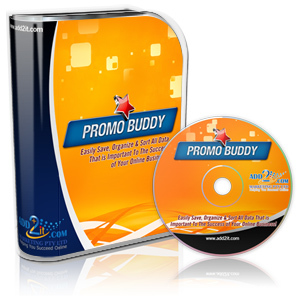 To download your free copy of Promo Buddy 2.0, please click here! This entry was written by Frank Bauer and posted on May 31, 2009 at 6:50 pm and filed under Business Organization Tools, Desktop Software. Bookmark the permalink. Follow any comments here with the RSS feed for this post.